Are you looking for a gift for your child? How about a real, hardbound, colorful, intriguing book? 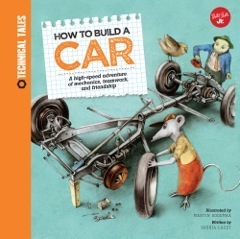 Here’s one you can consider for your youngsters – boys or girls, perhaps 5- to 10-years-old, whether or not they are interested in cars – called How to Build a Car: A high-speed adventure of mechanics, teamwork and friendship. The rich illustrations will first catch their eye and pique their interest in this action-packed, purposeful book. My Michigan-based colleague Steve Purdy provides a nice review of this new book. Click here to read why Steve has to say. This entry was posted in automobiles, book review, educational. Bookmark the permalink.